In the modern game, football can't go two weeks without controversy, be it due to diving, match-fixing or a peckish striker from Uruguay. We often hear the same remarks week in, week out, "Oh that wouldn't have happen 20, 30, 40 years ago. The game was played properly then." 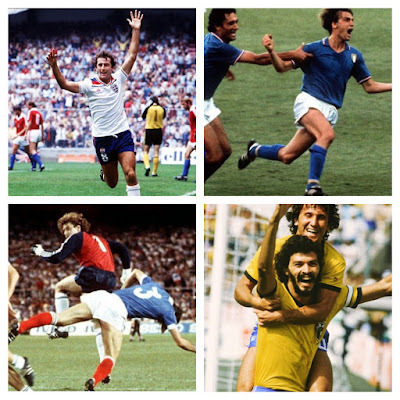 However in a series of blogs, we are going to look in depth at each decade of the twentieth and twenty-first centuries at football's scandals, major stories and the players which lit up the beautiful game every ten years. To paint a picture of the beginning of the twentieth-century, Britain was still a "Victorian" country, albeit Queen Victoria coming to end of her record sixty-four year reign. 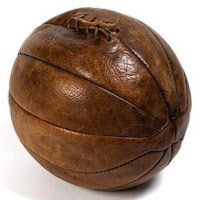 The modern football game as we know it was still in its infancy with teams like Chelsea and further abroad Real Madrid had not even been established. The major English teams at the start of the 1900-01 season being defending champions Aston Villa, Sunderland and Liverpool. The winners of the FA Cup were Bury, perhaps a surprise due to their recent history. The English First Division consisted of 18 teams as did the Second, ranging from "Woolwich Arsenal" (Arsenal's pre-dessecor) to Glossop. The present day success story of Manchester United, being a mere Second Division team under the name Newton Heath. Elsewhere around the globe, football had taken a little longer to spark into the multicultural phenomenon it is today. In Spain, Real Madrid were founded in 1902 as "Madrid FC" after being introduced to the game by travelling Oxford and Cambridge students in 1897. Their Catalan rivals Barcelona were established three years previous in 1899 again after a British and Swiss influence. The only trophy of significance however in Spain in the 1900s was the Copa Del Rey, with Madrid winning it four years in a row (1905-08). The Spanish League (La Liga) was not formed until 1929. Further around the world, the influence of the English game could start to be seen across Europe and South America. The Italian Serie A being comprised of several round-robin leagues based in different regions. Italy itself still only a junior country of 39 years old. The initial Italian dominance being supplied from Genoa and Juventus. Genoa's full name (as it still is today) Genoa Cricket and Football Club, the team created as an English football team abroad. 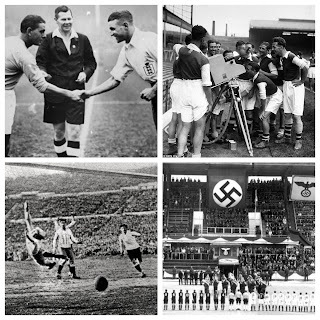 Like the Spanish League the Italian First Division did not take its league format until 1929, the German football association (DFB) was formed in 1900 from 86 different clubs clearly highlighting an early passion for the beautiful game. The first German team being the Dresden English Football Club, again showing the English influence abroad. In South America it would take until the following decade for the formation of CONMEBOL and the origins of respective leagues in Brazil, Argentina and Uruguay. Elsewhere CONCACAF and the United States national team would also have to wait ten years to be established. The English game was not short of scandals. The story of Billy Meredith throws up many similarities to modern day stories. 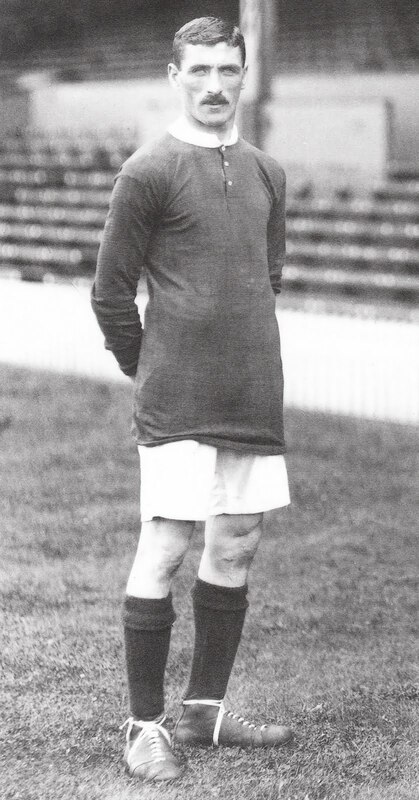 Meredith was an early superstar of the British game playing for both Manchester City and Manchester United in the 1900s. Instantly recognizable by the toothpick he chewed during matches, Meredith would score over 175 career goals and play 48 times for Wales. However in 1905 Meredith became famous for the wrong reasons. A bribery scandal broke out following a FA investigation into violence in football. It was found out that Meredith had accepted bribes from Aston Villa players in order to throw the final league match in the favour of the midlands club. As a result Billy was banned from football for 18 months and resulted in his transfer across Manchester to United. "You approve of the severe punishment administered by the Commission AGAINST ME and state that the offence I committed at Aston Villa should have wiped me out of football forever. Why ME ALONE? when I was only the spokesman of others equally guilty"
The early 20th century is often dismissed by football fans when assessing the greatest players ever. However the first decade of this truculent 100 years is littered with quality football and players. As already mentioned outside-forward Billy Meredith lit up the English game. As well has him, other stars were Liverpool's Scottish centre-half Alex Raisbeck, Tottenham and England striker Vivian Woodward and Chelsea winger Jimmy Windridge. Around Europe the match winners could be found with Milan's Renzo De Vecchi, Genoa's player-manager James Richardson Spensley. The Spanish game was graced by players like Madrid's Manuel Prast. "all that the opposition had to do was watch Meredith – the rest are no good"
Finally, a look at the 1900s greatest match, arguably for us here at TFHB it has to be the 1901 FA Cup final between Tottenham and Sheffield United. The match being two different games due the first being a pulsating 2-2 draw. Tottenham in 1901 were actually a non-league side, an by winning the cup following a 3-1 replay became the first team outside of the Football League to win the illustrious trophy. The first match was played in front of a staggering 110,820 people at Crystal Palace, London, as well as being the first ever to be filmed by Pathé news. Goals from John Cameron, Tom Smith and Sandy Brown provided Spurs with the upset and cancelling out Fred Priest's 40th minute opener. So there you have it, the first decade of the 1900s, and a ten-year spell of fantastic football, shameful corruption and immense footballing talent, roll on the 1910s! This is a very nice webside. 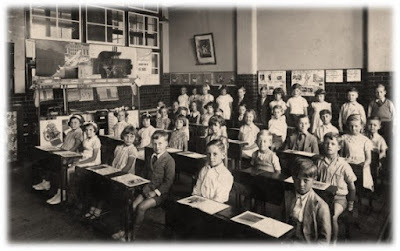 I would like to point out that in Germany beside Dresden the English cleric T. Archibald White formed a pupils team in a college close to Baden-Baden in 1872. 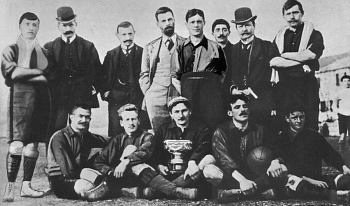 In 1893 the Baden-Baden F.C. was founded, which was made up of English and German players. White became the club's president. Thank you very much and thanks for the information - always eager to find out new bits of knowledge!